Thanks to Andy Mikonis for this information. 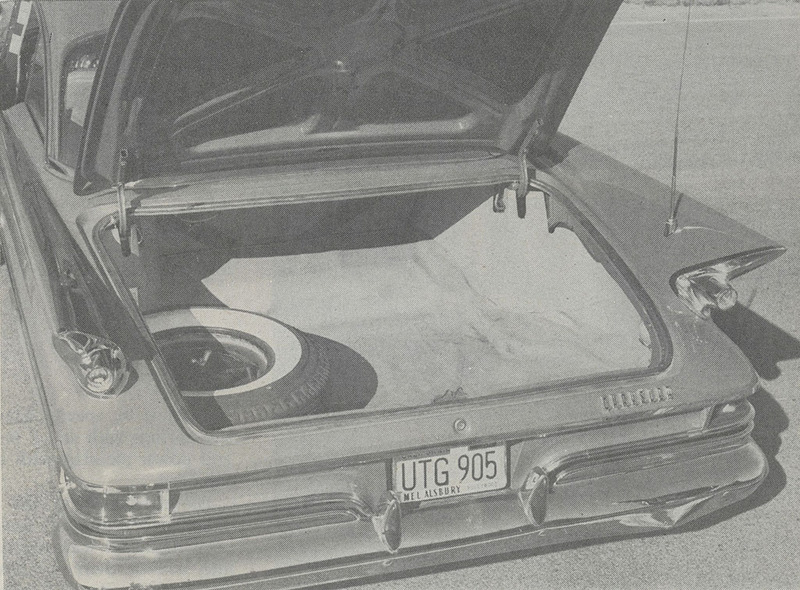 The Chrysler 300G trunk is trimmed the same way as all other 1961 Chrysler models. Exposed sheet metal is painted body color. 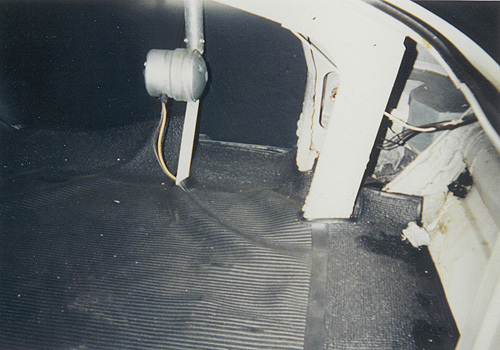 It is lined with cardboard panels and a rubber mat, both either in black or gray. There is no correlation to production dates in the occurrence of either color. The mat has a pattern of longitudinal ribs on the floor area, with a textured pattern around the border. It extends up over the tunnel over the rear axle, in the textured pattern. The mats survived poorly and are extremely rare to find intact. 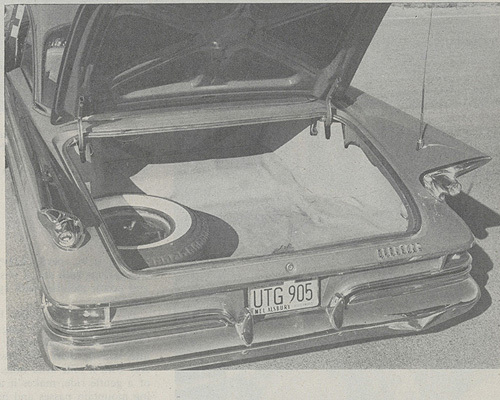 300G coupe with gray panels and rubber mat from the April 1961 issue of Motor Life. The spare tire on the 300G was a 8.00x15" Goodyear Blue Streak racing tire. The whitewall width varied between 3" and 3&3/16". A carpeted spare tire cover was not available on the 300G. 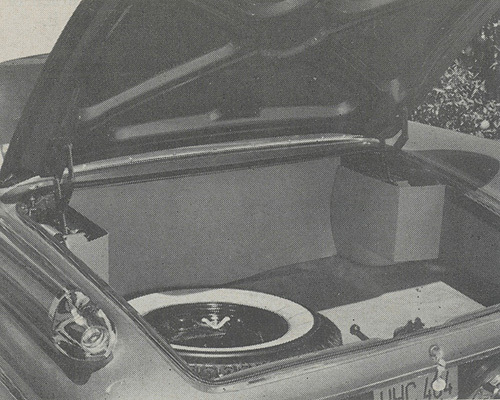 300G convertible with gray trunk trim from the August 1961 issue of Car Life. 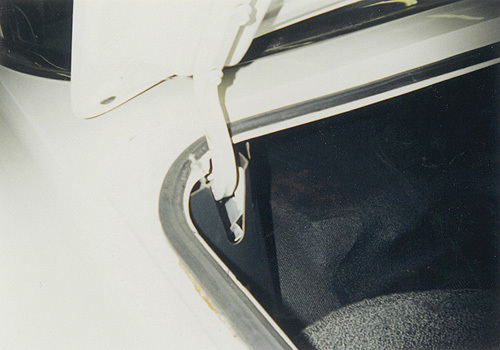 Convertibles have a cardboard liner across the back separating the the top well from the cargo area. 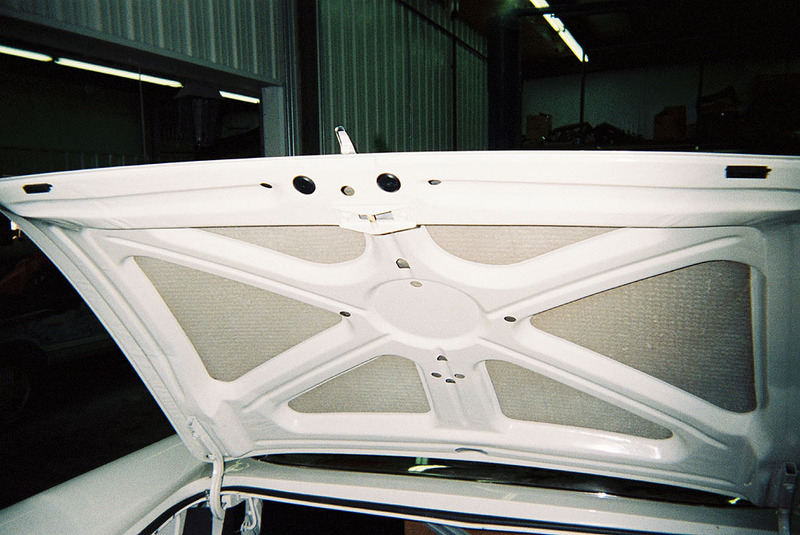 The following photos were taken of an original 300G coupe owned by Steve Frisell in Nebraska. This survivor 300G has traveled only 71 miles from new. It is the most original and lowest mile 300G known to exist. This car is equipped with the black trunk panels and mat. Under the lid of the 300G with 71 miles. The strike is painted over, as is the asphalt-type sound deadener, which generally appears to have absorbed the paint. Rubber plugs and bumpers were installed after paint. 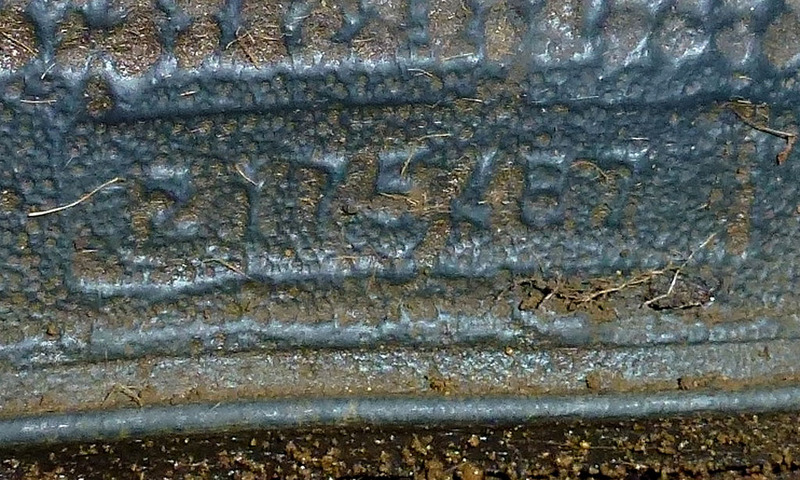 and detail of the mat. 71-mile 300G. 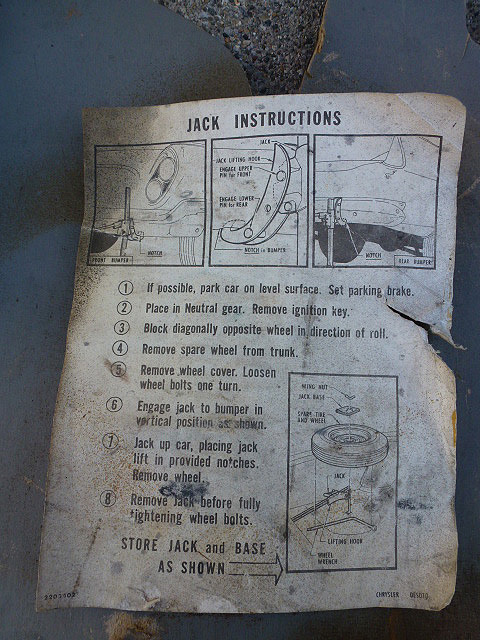 Inner left side showing jack instructions location. 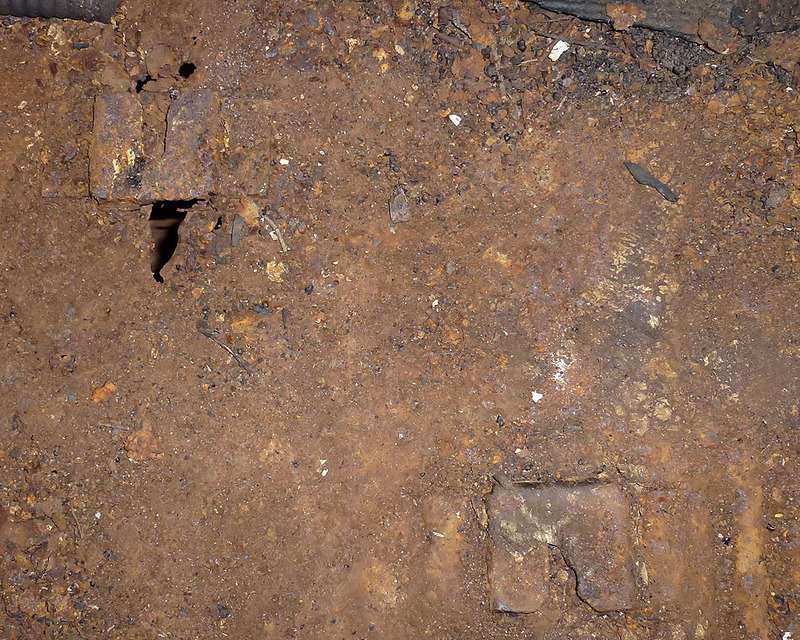 Jack and tire iron are stored beneath the tire. 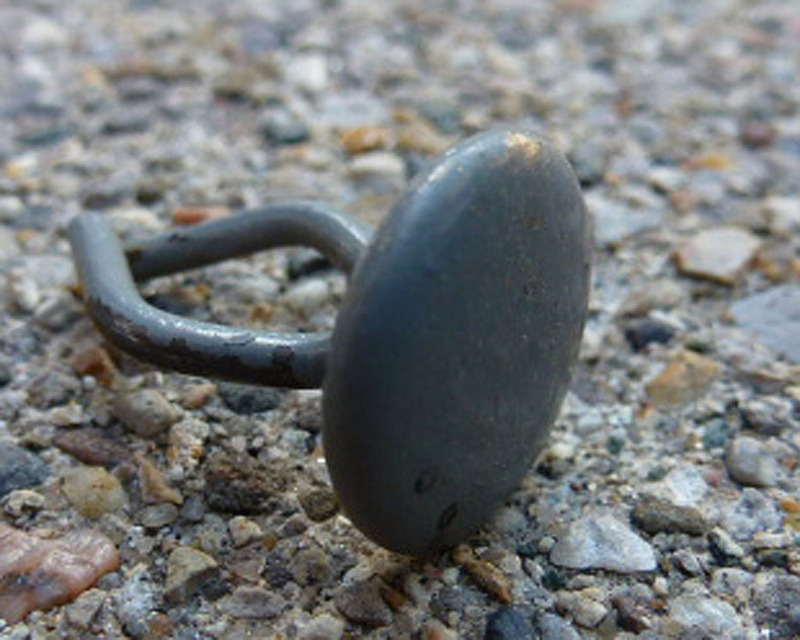 The jack post is visible aft of the tire; cardboard liner has a notch for the other end of the jack. The tire cover is not stock. 71-mile 300G. 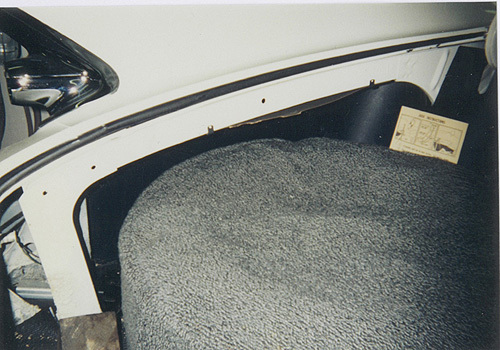 Back of rear seats and under rear shelf. No trim here in a coupe. 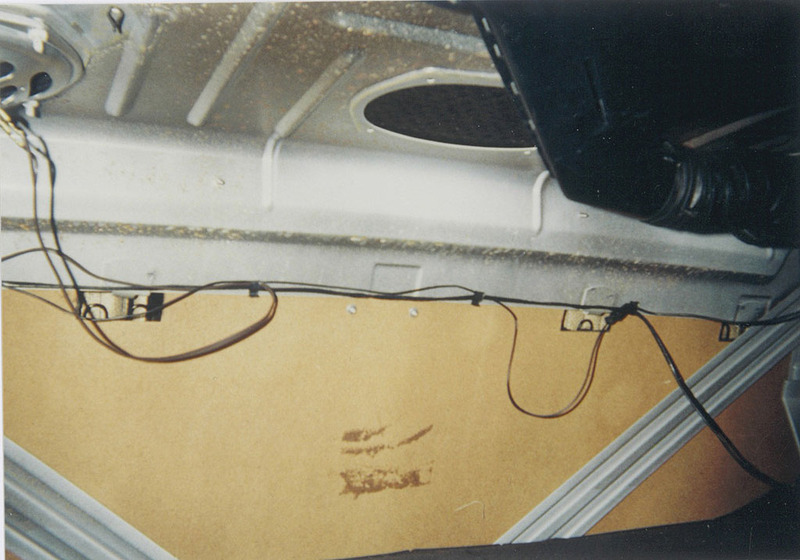 This shows the location of the optional rear seat speaker and optional rear window defogger. 71-mile 300G. Torsion bar style hinges in coupe. Shows light switch location. The 300G convertible uses twin coil sprung hinges. Black mat is part number 2175487, found at the right rear. Parts book shows gray mat as 2176070. There is also a notation for convertible coupe, black, left, 2249552. Jack instructions for all 1961 Chryslers. 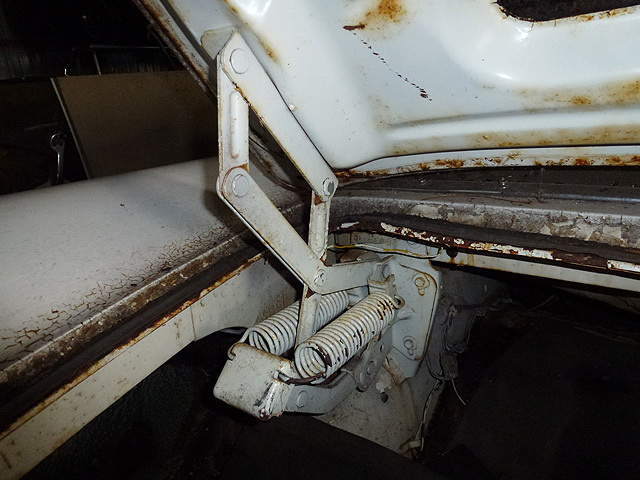 The head of the bolt that holds down the spare tire and jack base slides into a bracket welded to the trunk floor. Pictured at the upper left is the location for the coupe bracket. 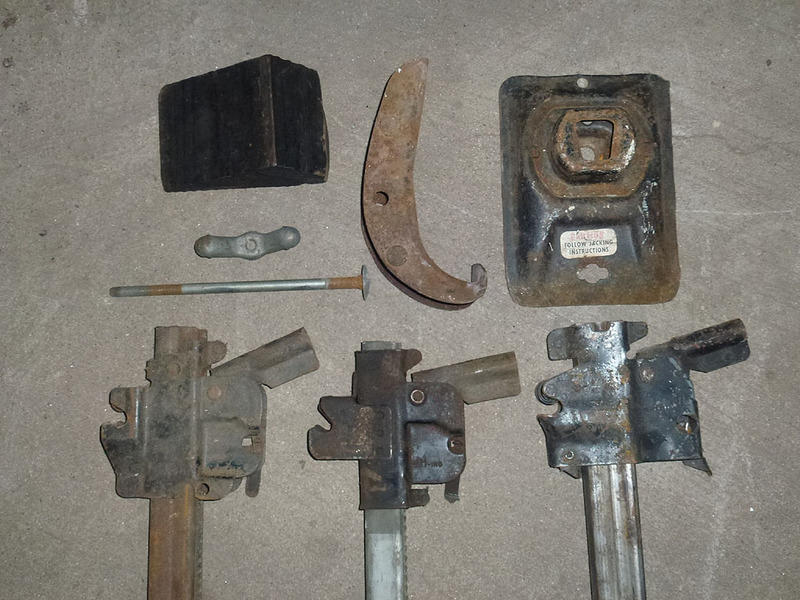 At the lower right is the second bracket welded into a convertible to relocate the spare for additional clearance for the hinge and trim. Convertible trunk volume is reduced to 31.1 cubic feet from 34.1 cubic feet in a coupe, according to AMA specifications. Three variations of the jack. Ratchet mechanism painted black, post not painted. All use the same bumper hook, painted black as is base and wheel chock. Hold down bolt and wing nut. Why do some 300Gs have chrome "300" numbers on the lower left corner of the deck lid and some do not? The artist renderings in the 300G sales catalog show the cars with numbers but early production cars did not have them. An original owner of a 300G told me he noticed the numbers started appearing on 300Gs in the showroom around January 1961. This has been consistent with my survey of 300Gs.